The parent council is a group of parents who are interested in what is happening at the school. That’s it. Last year we organised an assault course, disco, film nights, a summer craft evening, a school cookbook and more. We used the funds to buy things ranging from book bags to cameras and ukeleles (and a cupboard to keep them in) to sports strips. We also represented the concerns of parents at meetings with Scottish Borders Council over the asymmetric week and staffing levels. 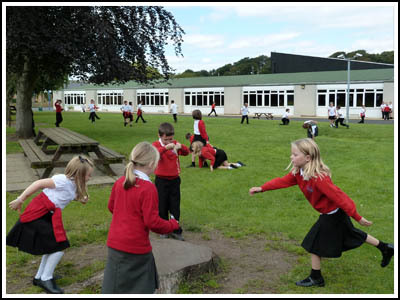 This year we are already hoping to build an outdoor classroom as well as providing funds for new school furniture, books and the Christmas Show. We have also committed to contributing £3 for every child towards the cost of school trips. We have separate fund-raising committee and a governance committee which meets with Ms Bready (and Scottish Borders Council when appropriate) to discuss issues relating to the management of the school. We are here to represent all parents so if you have a concern or an idea about the school let us know, ideally by joining us! There is no minimum commitment: we hold meetings (always an hour or less) once a term (twice in winter), normally on a Wednesday evening, with the fundraising and governance groups holding separate meetings as necessary. All are welcome at the general meetings and the fundraising ones, but you will have to be an elected member if you want to take part in the governance discussions. All members can be contacted through the school. Click on the links for copies of our most recent Agendas, Minutes, Newsletter and Accounts. You may find out more information by looking at the Scottish Borders Council Parental Involvement Strategy on the SBC website.